Do we want “what went on in Vegas” to stay there? Of course we don’t and I’m very happy to share the goss with you. Read on to find out what everyone was talking about at NAB, it just so happens that it was four of the companies that Aspen Media represents. Incidentally, you can now find DirectOut together with all our other suppliers on one website www.aspen-media.com. Check it out today. Every visitor at every show is always on the lookout for ways of saving money and making life easier without compromising the standards that they work to. 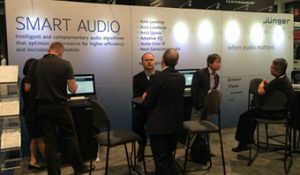 Those smart guys at Junger Audio spent their booth time demonstrating just how this could be achieved in Live production using the auto levelling, auto loudness control, auto upmix, adaptive EQ and audio-over-IP in the D*AP range while maintaining high quality, consistent and coherent audio no matter what the operator skills and manning levels. The chat on the Salzbrenner media booth was all about the new NIO xcel range of professional Dante interfaces. Two of the new units provide I/O for AES3 and another has 8 mic inputs with 4 splits, 8 line inputs and 4 line outputs. All the devices include filters and a mix function and they’re a doddle to configure via a web browser. NIO xcel series is rugged in design and built for all the rough and tumble of mobile applications. 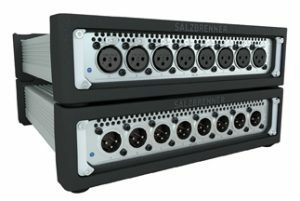 You’ll find they’re indispensable for Broadcast derigs, sound reinforcement and installation and they’re just as useful in studio facilities where they can be stacked or mounted in 19″ racks. Visitors from Broadcast, Live and Studio were seen in their droves on the DirectOut booth. They’d come to see the updated MONTONE.42 MADI-to-Ravenna bridge. MONTONE.42 supports 32 Ravenna and AES67 compliant streams and the internal matrix handles 256 network and 256 MADI I/O channels. There are four MADI ports with a wide choice of physical interfaces and two gigabit network ports. The powerful 1024×1024 MADI router M.1k2 has also had an update making it a more secure and resilient investment for any system designer. It now supports SNMP, Simple Network Management Protocol, for monitoring essential device information such as power supply, temperature and MADI signal/synchronisation status. The big draw on the JLCooper booth was the new switch controller Proton, an economical, compact broadcast switcher panel for controlling BlackMagic ATEM in Live production. ATEM switches SD, HD or Ultra HD video from a wide range of video sources including cameras, computers and disk recorders. 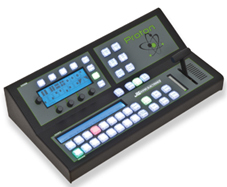 Proton provides all the switcher control you might need for most AV, Sports or Live streaming applications.